Powers/Abilities: Connors had access to the advanced equipment of Cross Technological Enterprises (CTE), including the Nucleonic Radiator. He was a bigot and overall not too nice of a person, willing to sell weapons to dictators or terrorists, as well as to hire an assassin to take out anyone who gets in his way. He was also sweaty...and probably quite smelly. (Marvel Fanfare I#3/2 (fb) - BTS) - Apparently the head of nuclear research at CTE, Connors fired Ronald English when he refused to give them the rights to his Nucleonic Radiator. English took the plans to the Radiator with him, leaving only a single prototype behind. (Marvel Fanfare I#3/2 (fb) - BTS / Black Goliath#2 - BTS) - Intending to replicate the device secretly and then sell it to dictatorships around the world, Connors hired the mercenary Warhawk to follow Ronald English, who had used the plans to become the super-villain Atom-Smasher, presumably in an effort to obtain the plans to the Radiator. (Black Goliath#2) - When Atom-Smasher seemed on the verge of defeat at the hands of Black Goliath (Bill Foster), Connors ordered Warhawk to kill Atom-Smasher, presumably to prevent investigation of his powers and background leading anyone back to Connors plans for the Radiator. (Marvel Team-Up I#92 (fb) - BTS) - Mister Fear led his henchmen to bomb an armored car from Cross Technological Enterprises (CTE), which carried a radioactive isotope. CTE's security chief, Hawkeye, confronted them, but exposure to the fear gas caused him to flee, and Mister Fear and his men escaped with the cargo. However, Hawkeye had had the foresight to place a tracer within the cargo. (Marvel Team-Up I#92) - Connors contacted Hawkeye, hinting that if he didn't retrieve the valuable property lost under his watch that he would be fired. (Marvel Fanfare I#3/2) - Having learned of CTE's plans for the Radiator, the swashbuckling vigilante el Aguila broke into CTE to destroy it. Aguila pretended to knock himself out by sticking his electrified sword in a water sprinkler, after which Connors emerged and congratulated Hawkeye on his work. Ignoring Hawkeye's instructions that Aguila was still dangerous and should be locked up somewhere safe, Connors slapped a pair of handcuffs on Aguila, made some racist slurs towards him, and dragged Aguila in to show him the Radiator, intending to confirm that was what Aguila had come there after as well as to rub his nose in his failure. However, Aguila then used an electrical charge to set off all of Hawkeye's arrows again, exposing Hawkeye and Connors to sirens, flares, tear gas, anesthetic gas, etc. Revealing what Connors had planned for the Radiator, Aguila approached the device. As Connors yelled racial slurs and commanded Hawkeye to stop him, Hawkeye fired an arrow that missed el Aguila before collapsing to the ground. Unimpeded, Aguila hurled the Radiator to the floor and shattered it with a stomp of his foot (possibly amplified by an electrical charge) before thanking Hawkeye for his assistance and then departing. Though Hawkeye wasn't 100% certain whether he had missed on purpose, he was nonetheless glad that he had missed. Connors accused Hawkeye of having been in league with Aguila and threatened to have him fired and to prevent him from ever working again. Hawkeye, however, reminded Connors that the cameras showed him leading Aguila right to the Radiator, and he threatened to take the footage to the head of CTE if Connors made trouble for him. Identified and fleshed out by Charlie Boatner, Trevor von Eeeden, and Josef Rubinstein. Big thanks to the Continental Op for pointing this story out...or I would probably still consider Atom-Smasher's death something of a mystery. 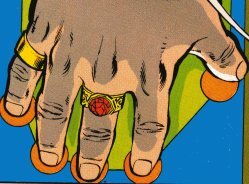 Interestingly, Atom-Smasher is never mentioned by name in Marvel Fanfare, but his involvement with the Nucleonic Radiator, as well as Connors' bald head, large frame, secret plans, and the many rings on his fingers make it pretty obvious. Atom-Smasher's development of the Nucleonic Radiator and his employment at Cross Technological Enterprises were confirmed in the Fantastic Four Encyclopedia. 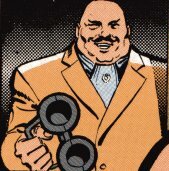 The only thing as yet unrevealed is Michael English, brother of Ronald, who succeeded him as Atom Smasher, claimed to have hired the assassin that killed Ronald. Well, either he was used as a third party by Connors to hire Warhawk without being directly connected, or maybe he just hated his brother enough to claim the credit anyway. Thanks to Per Degaton for pointing out the Marvel Team-Up appearance. Even cooler that Boatner used an existing character. Anyone know how to contact Charlie Boatner? Working with his brother Michael, Ronald English designed a prototype Nucleonic Radiator while working for Cross Technological Enterprises. When Ronald English refused to give up the rights to the device, desiring to patent it himself, his supervisor, Ambrose Connors has him fired. English took his plans with him and built a new device which he used to become the super-villain Atom-Smasher. Intending to replicate the device secretly and then sell it to dictatorships around the world, Connors hired the mercenary Warhawk to follow Atom-Smasher, presumably in an effort to obtain the plans to the Radiator. 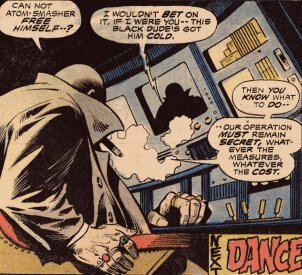 However, when Atom-Smasher seemed on the verge of defeat at the hands of Black Goliath (Bill Foster), Connors ordered Warhawk to kill Atom-Smasher, (again) presumably to prevent investigation of his powers and background leading anyone back to Connors plans for the Radiator. With Ronald English dead, Michael either used Ronald's Nucleonic Radiator or developed a new one and used it to replicate his powers, adopting the name Atom Smasher and a variant of his brothers costume, but Michael apparently perished in battle with Giant-Man (Bill Foster). Connors had his agents strive to replicate the prototype Nucleonic Radiator, but el Aguila learned of the device and destroyed it. The Nucleonic Radiator emitted killing radiation at a short range, but the radiation could be blocked by a special fabric. CTE allegedly planned to sell the Radiator to dictatorships around the world who could use it for "crowd control," to crush any form of protest, while the military police would be safe within uniforms made of the protective fabric. Both Ronald and Michael English used the Radiator to give themselves radiation powers, including the ability to turn into living nuclear energy.